Hollow Metal Doors provide unvarying, long-lasting quality, and security while outlasting conditions that would deteriorate normal wood doors. Hollow metal doors are available with insulation and/or vision kits depending upon your needs. Where you can find them: School Gyms, commercial buildings, hospitals, offices, etc. 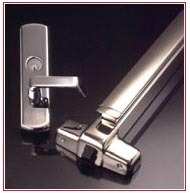 At McKernan Doors, Inc. we are happy to supply only or install the products you purchase from us. We can service or replace whichever type you have, whether you have a surface mount, overhead concealed, or a floor closer. We keep a large inventory of hardware in stock to get you up and running right away!